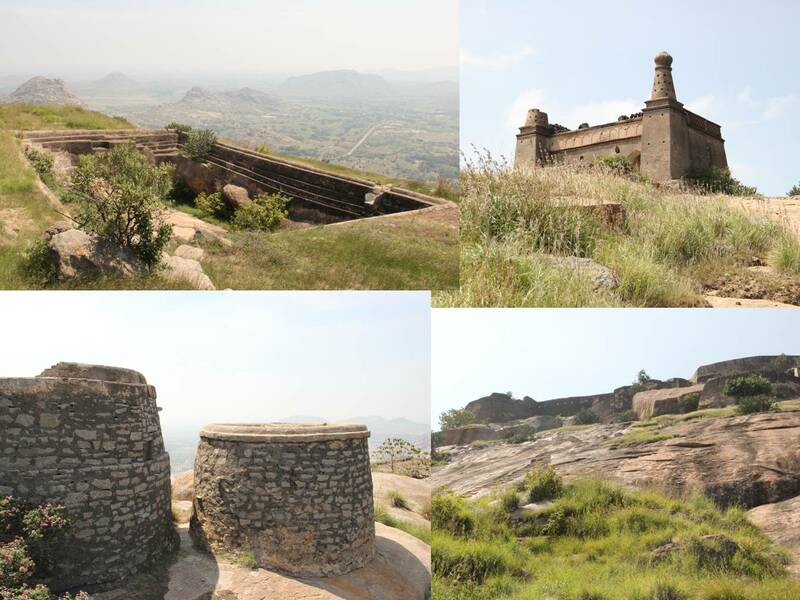 The last time I traveled to Madhugiri Taluk of Tumkur in 2011, I could not cover it in a day. Since then several plans to trek Medigeshi fort got dropped. But finally on October 27th it materialized. Naresh and I left home at around 6:30 AM and took the NICE road upto Peenya and then the toll way across Nelamangala. This is your fastest bet outside the city from where I Live (Basavanagudi). At Dabaspet we took a right deviation to Madhugiri. The villages in Tumkur where in a festive mood, celebrating Bakrid. We made a quick stop some for tea and bun. 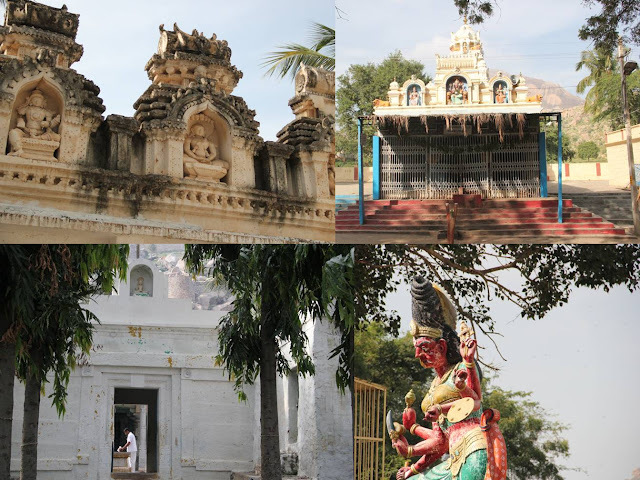 At Madhugiri, I stopped to view the places that I missed last time –Dandina Maramma Temple and a beautiful ancient Jain Basadi called Mallinatha basadi. Even though the Basadi was closed the villagers asked us to open the doors and get in. Inside, a peaceful brass idol of lord Mahavir stood in backdrop of glow from a single lamp. To reach Medigeshi, at Madhugiri one needs to take the road to Pavgad and travel around 14kms. A police constable requested for a lift until a neighboring village where he was on duty to provide security during Bakrid celebration. The road condition after Dabaspet is pathetic and when we asked the constable he said this was mainly because the MLA’s who get elected in Madhugiri are basically outsiders and has never been someone from the same place. This time it is Jyothi Kumaraswamy (First wife of our Ex-chief minster) who hails from Hassan. Obviously these candidates have no affection towards the taluk. Naresh and I discussed the need to bring in a rule that only the origins of certain town or village could be nominated for post during election as to understand the needs of the localities better. While entering Medigeshi, before you hit the town there is a sign board pointing left towards the temple and fort. As we parked the car near an ancient Veerabadra temple, an old lady came towards us asking – “Sorry, I can’t see properly. Whose kids are you?” We had to explain her that we were just tourists and not representatives of any forefathers hailing from her village. With help from two villagers we got on track. They asked us to follow the two entrance like construction on the hill. Once we climbed till there we saw some trail here and there. Yet it was not very clear and one could easily get lost. You have to go right after the second entrance and then climb up a steep rock. On our way up a bunch of kids came running to the base and started calling out for us. They wanted to guide us and also inquired if we were foreigners. I suppose they expected to guide for money. But when we refused they seemed disappointed and did not climb up to us. They warned us of the bears though. We met another group of kids who were returning back with a drum. One of the kids told us that the drums were to keep the Bear in the caves. So the bear story is real. The boys kept hitting drums until we got a little distance uphill. After some trek uphill with intermittent trail you would reach a huge rock with carved steps that lead you to the main entrance of the fort. It took us not more than 50 Minutes to reach the top. Though it’s a short trek, it isn’t very easy either. Absence of trail and steep climbs make it a little more than an easy trek. It was interesting to see most of the fort still intact. On top we were surprised to see several artificial ponds, arsenals, rest areas and a beautiful tomb. The tomb is intricately designed with two towers each with tiny staircase leading to the top. From the top Medigeshi village looked very quiet and peaceful with its two beautiful lakes, clustered houses and lots and lots of agricultural land. We explored the hill a little bit more and when we were about to return, we met a group of youngsters who requested me to take their picture and email it to them. So, I did that. They told us that the village got its name after the wife of Nagi Reddy who had hair till her foot (In Kannada – Himmadi keshi) it then was called Medikeshi and overtime became Medigeshi. They were proud of the fact that few days back a popular Kannada newspaper had covered the historical importance of their village. We were told that Hyder Ali too ruled this fort at some point and perhaps that explains the tomb. They also told us that recently people began to look for hidden treasures in the fort and failed to do so. Now the rumors are that there are hidden treasures in the neighboring hill called Shankara Betta. We thanked them and returned back. At the village there is a small well; the water from which is supposed to be very sweet. It is called – Seeneeru Bavi. However when we saw, the water looked very polluted and undrinkable. It had a color similar to Pista milkshake that made it weirdly opaque to be water. On our way back we stopped at a “Santhe” (weekly market) and bought some fresh vegetables for real cheap price. Hungry like dogs, we began to search for a good hotel in the town and luckily for vegetarians like us, we found a Brahmin’s café. Colored rice with Vada served on an organic plate could be counted among one of the most delicious food I have had so far. A filter coffee was like an icing on the cake despite its sugar content. We next drove to Devarayandurga which is a right deviation on the way back to Dabaspet. (So if you are coming from Dabaspet, it’s a left turn before Madhugiri). Devarayandurga is more commercial with lots of tourists driving up the hill; yet it is a beautiful place. The drive is filled with lots of trees and the view from the top is beautiful. Approximately 500 steps from the car parking lead you to the Laxmi Narasimha temple. There is also another small trek to a view point. We drove to Bogha lakshmi Narashmiha temple on the other side of the hill as well. Next stop was Namadachilume (On the way to Tumkur from Devarayandurga) which boasts of natural hot springs. 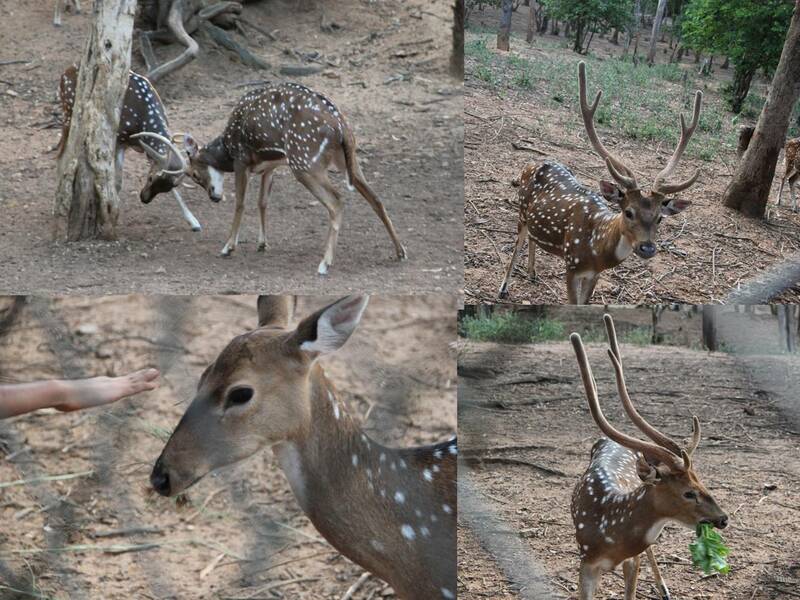 But it is a big disappointment as there is nothing worth to see expect for a walk through the deer park. At Tumkur we stopped at the famous Pavithra hotel to try Masala Dosa and Thatte Idly. We reached back home around 7:30 PM after an interesting day and finishing one more Taluk of Tumkur District. That is a great place for a day-outing. And after the trek masala dosa and idly sambar tastes divine! Really GREAT post (as always)- hidden treasures, great food, funny looking water...and all! Ah yes, have missed your blog posts. Welcome Back Anjuli. Missed your posts too. Where have you been? Anyways glad to have you back on blog world. beautiful area. wonderful, ancient temples. Wonderful description, and a great place for a day visit. Beautiful pics! Hope you had a great diwali! Sorry for being away! Yep had a nice festival. Im from medigeshi only thank you for writing on our village . .. .Really a very nice blog with a detailed information . . . if u want to visit again call 8971997988 .
and you forgot mention one more thing in our village (Medigeshi ) total 100 temples is there.